Recently, I harvested the seed from mustard lettuce (mustard greens) growing in the old garden bed on the house side of the hermitage. I always plant more veggies than I can consume, cause then I can allow the second half to flower and go to seed. Original I obtained heritage seed varieties so that they did not lose the ability to produce fertile seed stock. Many commercial brand seeds are bred so that the child-seed is not viable – a great way for big companies like Monsanto and others to ensure you have to keep coming back to them to buy your seed. Anyway, I harvested a good half kilo of seed. I talk about how I harvest the seed another time. Along the way, I have been wanting to reduce my use of plastics, reduce my dependence on supermarket shelves, reduce wastage of money, and provide myself with sustainable, nutrient rich food. Having enjoyed growing the food, preserving it, making jams and chutney, grinding my own herb seeds for cooking, and in the last few months growing my own yogurt. So now I thought I’d try growing sprouts in the kitchen. ° some sprouting seed – either grow your own, or you can get sprouting seeds from health shops. There are many different varieties of seed that you can sprout successfully. ° 1 large preserving jar cylindrical in shape (no narrow neck to stop the sprouts coming out). ° a piece of stocking or open weave mesh to stretch over the mouth of your jar. ° a strong rubber band to hold mesh in place. You’ll need to heat sterilise your jar and mesh first. Then give your seed a good wash first. Put a tablespoon of seed in a jar and 3/4 fill the jar with fresh water, place the mesh and band over the opening and swish around to remove any dirt from the seed. Drain off the water and do this several times to make sure the seed is washed clean. Refill to jar and let the seed stand in the water for 6-8 hours. This gets the seed ready for germination. After this time is up drain the jar by upturning it and leaving it upside down in the dish drainer or some suitable place. About two or three times a day fill the jar again, swirl the seed and water around in the jar, and then drain it again. This keeps the growing sprouts moist but not wet. I do this at breakfast, lunch and dinner – just cause I remember then. make sure it drains well each time. Keep repeating this daily. Within a few days you will see the seed growing and gradually filling the jar with sprouting plants. When the sprouts have grown sufficiently long to eat, uncover the jar, and place your new home-grown sprouts in the fridge to accompany your meals. 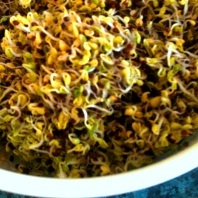 Then you might like to get another batch of sprouts started, while you enjoy that lot.